When I starting blogging about my recent trip to the Pacific Northwest last Thursday (2/20), I mentioned that I really made the trip for my quarterly soul-feeding and not so much about the coffee. But like the past 15 years of my life it’s always been about the coffee – both my love for the Northwest and coffee are SO intertwined. So, I am calling this post “Soul Dessert” because over the last 4 days I have had the amazing opportunity to cup 26 different coffees from 9 different roasters, tasted at least 20 different espresso/coffee drinks from many espresso bars/cafes and fed my soul at the same time with the amazing entree of the Pacific Northwest. I cupped several single origin coffees from Bolivia, Brazil, Sumatra, Kenya, Ethiopia, Costa Rica, Panama and El Salvador, plus a couple of espresso blends. I traveled and experienced parts of the world with only a cupping spoon in hand. In my last post, I mentioned choosing the “new wave” of coffee – the 3rd wave. The 1st wave of coffee in the U.S. was all about consumption, canned and freeze-dried coffee – beginning in the 50’s. In the 70’s we saw the sprouting of rad 2nd wave coffee roasters in the Pacific Northwest, who wanted to introduce a new way of coffee – import fine coffees, roast fresh daily and sell the beans. In the early 80’s we had the introduction of bringing the European culture and experience of espresso and coffee drinks to the U.S. – latte, cappuccino, au lait and espresso and coffee houses. The 3rd wave is all about being connected to the product (coffee) – where and how the coffee is grown, being connected to a roaster who roasts the coffee based highlighting and showcasing the finest characteristics of the coffee given it’s region of origin, growing and processing conditions and the climate for that growing season; along with knowing and being connected to all the people who labor everyday to make sure they are producing and processing the finest coffee grown in the world. The path Tazza D’Oro choose more than 3 years ago was the path of the 3rd wave. The change wasn’t easy and it was messy, but we did it – we survived and flourished. I am proud to say that we are fanatics about the training of our baristas (all of our baristas go through a certification process), we are passionate about the coffee, about the business of coffee, the culture and the community of coffee. I’m not sure what’s next, but there is another change coming and it was evident through my experience of the cuppings and the coffee scene in Seattle. All I know that Tazza D’Oro will be ready for whatever! 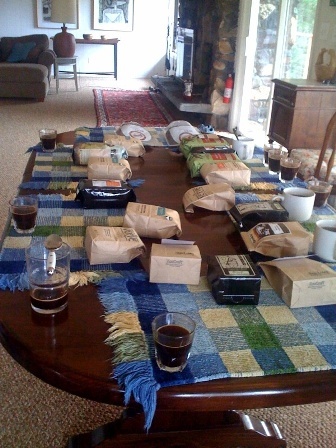 A partially dismantled cupping table – cupping coffee with the Pacific Ocean in view – WHOA! 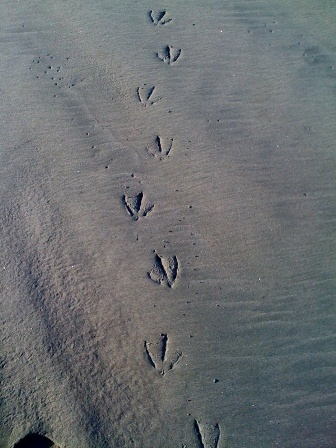 A little perspective after cupping and talking business – a walk on the beach! 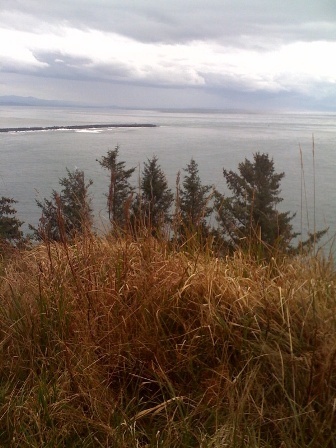 One of my favorite views – a view from the lighthouse at Cape Disappointment, where the Columbia River meets the Pacific Ocean – just to the right of the jetty in the pic. I can only imagine what the explorers of the Lewis and Clark expedition said when the saw this view – probably the same as me – OMG, it’s so beautiful! After being at the beach over the weekend, we headed back to Seattle overnight. One of our favorite restaurants is the Palace Kitchen in Belltown. 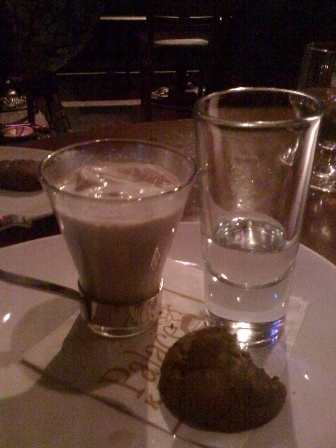 Our “soul dessert” was a cafe affogato, amarone grappa and a house-made chocolate cookie!